There is a reason Ramen noodles are so popular with college students. You boil water. You add the noodles. You stir in the seasoning packet. It’s not just college students who love easy, of course. We all do. We like quick, we like simple, and we like not having to think too hard. It’s why self-help tips like “visualize success” and “acknowledge your flaws” get repeated ad nauseam. They’re so easy to do, they don’t require any real time or effort. Too bad blog tips aren’t like that, though. Blog tips are usually time consuming and difficult to implement. If only there was a list of easy blog tips. If only there were blog tips you could do in a couple minutes. If only there was a list of blog tips which made blogging simpler rather than harder. 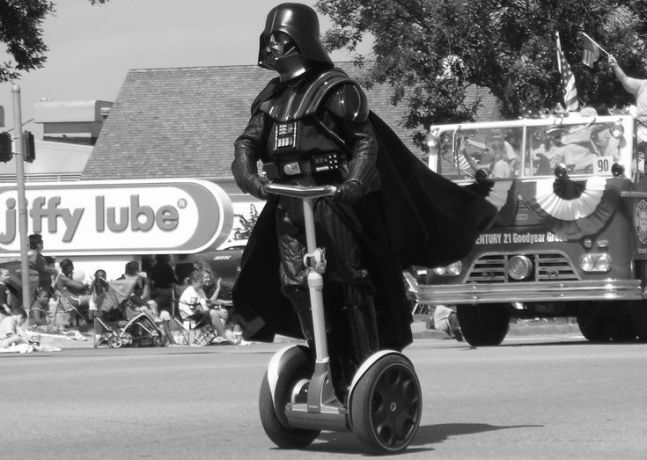 This photo of Darth Vader on a segway is supposed to represent a segue. Here are 22 hopefully-easy blog tips broken down into general categories. Some of these you can do immediately, some you can do the next time you sit down to write. All of them, hopefully, are as easy as a game of checkers. Just remember: no blog tip, listed here or elsewhere, is right for everyone. Use what works for you. Disregard the rest! The only reason to use it is in instances where the reader could reasonably think you are speaking figuratively when you really aren’t. So yes, if monkeys actually fly out of a part of your anatomy, use the word “literally” to describe the event. But then go see a doctor. Actually, go see the doctor first. You can write later. It’s been said the word “that” could be removed from a sentence and 99% of the time the sentence wouldn’t miss it. I wouldn’t go quite that far, but you should definitely use “that” as little as possible. Depending on how much you use the word, omitting it could significantly clean up your writing. Remember when you were assigned a paper in school and you tried to break sentences into as many paragraphs as possible to stretch the length of your paper? Teachers didn’t really like it. And they usually took points off your paper for doing it. Well, as a blogger, this formerly-looked-down-upon tactic is a good thing! It promotes white space. It makes your posts easier to read. So if you ever bump into your old English teacher, tell her Kevin at BeABetterBlogger.com says it’s a-okay to have as few sentences as possible in a paragraph. Also, ask her to join my mailing list. You know…because. Unless your blog is brand new with little-to-no material, there’s no reason when you’re writing to not link to other (relevant) posts you’ve written — especially since it’s so effective and so easy. Portent’s Content Idea Generator creates a headline for you based on the subject of your post. Don’t like it? Hit the refresh button and get a new headline. You’re unlikely to be able to use any suggestion as is, but you’ll get some good ideas. If only “food” started with a M.
And there’s a reason Stan Lee created characters with names like Bruce Banner, Peter Parker, Sue Storm, Pepper Potts and Doctor Doom. Try using alliteration in your next headline. Don’t make someone who wants to search through your content — an engaged reader, in other words — have to hunt for your search bar. Make it easy for them. Top of your blog or near the top of your sidebar are the two preferred choices for search bars. Adding one to your footer, too, isn’t a bad idea. If you use WordPress, this is as easy as adding (or moving) a search widget. Guess what? If someone goes to the trouble of looking for your Twitter, Google+ or Facebook icon, chances are they’re doing so because they want to follow you. Add your social “follow me” icons to the top of your blog or near the top of your sidebar. Again, if you’re a WordPress user, this involves adding or moving a widget. Don’t have social media icons and don’t know where to get them? With those two settings any icons you find will be free to use and require no citations or links to their authors. Are you trying (and failing) at gaining momentum on multiple social media platforms? Yes! Tom’s still my MySpace friend! Why be mediocre on several platforms when you can concentrate on one (and hopefully excel)? Consider removing all social media “follow me” icons except your preferred one. The one where you’re most active. The one where you want to gain a following. If that’s Twitter, keep Twitter. If it’s Facebook, keep Facebook. If it’s MySpace, I’m afraid I cannot help you. Once you’ve gotten a handle on one social platform, you can add others. A reader who has made it through to the end of your post (likely) enjoyed what you wrote. Well, tell them what to do next! Tell them to leave you a comment. Show them some related posts they might like to read. Ask them to sign up for your mailing list. It’s your blog — point them in the direction you want them to go. If you tell them nothing, they will do nothing. Actually, that’s not true. They’ll leave. Do you have one or two Google Ads on your blog? That’s fine. What’s that? You have 27? Yeah, that’s a problem. Get down to under 4 ads and your blog will be significantly more friendly to your readers. If your priority one is for readers to sign up to your mailing list or follow you on Twitter (or another social media platform), why give them the option of instead following your blog through RSS? You can’t (or shouldn’t) prevent people from subscribing to your RSS feed. For some, RSS feeds are still the easiest and best way to keep up with their favorite blogs. But that doesn’t mean you have to offer a big ol’ RSS icon in your sidebar or top of your blog when what you really want is for readers to subscribe to your newsletter. Again, you’re pointing the reader in the direction you want them to go (or not go). No, this isn’t an ego thing. Most readers want to know who they are reading. So, offer a head shot. Be a person, not an ominous voice behind a curtain. In other words, it is time to declutter. Count how many different colors you use in your blog design. Is it more than a handful? If so, if you’re not careful, you could be confusing your readers. At the very least, you’re making it difficult for your action color to stand out. Start by eliminating just one color from your design. See what kind of difference it makes. For WordPress users, the free WP-Smush.it plugin lets you reduce the file size of the images you upload. You can also “smush” (reduce) images you have uploaded previously. For you non-Wordpress users, don’t worry: Yahoo lets you use its Smush.it tool via a web browser. No software or installation necessary! Just go to Smushit.com, upload your image (or images) and click the “smush” button. Then you can download your newly-optimized image and upload it to your non-Wordpress blog. Why? For optimal Pinterest pin size, of course! Rob Russo, a designer who has run repeated tests on Pinterest pin sizes, currently recommends 735×1102 as the perfect size for Pinterest. Rob seems to know his stuff, so if you’re looking to make your posts more Pinterest friendly this is a good tip to follow. Aren’t these dimensions quite large, as Henneke Duistermaat points out in her comment? Definitely. However, if you’re focusing on Pinterest and want your posts to be as Pinterest-friendly as possible, it may be worth it to design your blog around these extra-large featured images. What do I do? I compromise. The width of my featured images is 735 pixels. The height is whatever makes sense for the particular image I’m using. Just remember: “bigger is better” with Pinterest. Do what makes sense for you and your blog! For many bloggers, the About page is one of the two pages (the other being the Contact page) created within the first few days of starting your blog. It’s also one of the two pages on your blog which haven’t been touched since they were created. If you haven’t updated your About page in a while, look it over and see if everything that’s there is still relevant. Every so often, I come across a blog or website without an About page. HubSpot’s Blog Topic Generator lets you put in three terms you would like to blog about, and it will output five different topics (headlines included). “The History of Money” sounds like it would be a bear to write and “Think You’re Cut Out For Doing Sports” sounds like something written by someone without a firm grasp of sports (or the English language). But the others seem like great suggestions for a money or food blogger. If you haven’t added Google Authorship to your blog yet, it’s time. If you already have a Google+ account and the WordPress SEO by Yoast plugin, setting up authorship can take less than 10 minutes. Need a more in-depth tutorial? Here is the definitive handbook on the subject. True, many bloggers who post excerpts of others’ works don’t bother to find out if they consent to such acts. However, some do. And if you want to make it easier for these bloggers, and thereby making it easier for your work to be featured and quoted, add consent verbiage somewhere on your blog. Excerpts of content may be used, provided full & clear credit is given to us with appropriate & specific direction to original content. What does this mean? It means people are free to use excerpts of my content, but they’re required to give me credit and provide a link to my blog. If you have been blogging for any length of time, you have quite a collection of posts in your archive gathering dust. Many of your readers don’t even know these gold nuggets of info even exist. Pick one of them and share it on social media. It doesn’t matter if it’s old, so long as the information is still relevant. Next week, do the same thing with a different post. As pointed out by Eric Deeter in a comment below, another great promotion tip used by many bloggers (including yours truly within this very post) is adding “tweet this” links next to content you wish to highlight for promotion. This makes it easy for readers to share. A person might not want to share your entire post, but they might really like something specific you said within the post! Personally, I hardcode my “tweet this” links. But for ease of use, try ClicktoTweet.com. It lets you create links with no coding required. Not all tips are right for every blog and every blogger. Are any of these tips right for you? Do you know any easy blog tips which can be implemented in minutes? Let me know in a comment below! Flickr Creative Commons Images via Matthew Paulson (adapted), Wesley Fryer (adapted), Seth Anderson (adapted) and ClintJCL (adapted). Good advice! I enjoy reading your blog, Kevin. I recently started a blog and I’m always looking for good tips. I had to check out your blog to see if you were “Troy my ol’ friend” or not and sure enough you are! I’m glad you enjoy my blog. How long ago did you start yours? I recently looked into optimal image sizes, too. I came to the conclusion that there’s no perfect answer. As Twitter and G+ are currently most active social media platforms, I decided to go for 590px wide x 295px high. 590px is the width of my current blog and it’s wide enough to be automatically shared as a big image when people use the G+ button. I chose 295px high because a ratio of 2:1 makes the picture show up well in Twitter streams. What do you think? Does my choice make sense? I guess if Pinterest is important, than one might choose a different image size. But yours isn’t 735×1102 either, is it? That seems very tall for a blog post image? Yes, 735×1102 is quite large and, as you pointed out, my featured images aren’t that size either. I think the dimensions of your images are great, Henneke. For Twitter it’s especially good (given the 2:1 ratio your mentioned) and for Google+ it works quite well. Pinterest is a different animal. It rewards “pins” that are very tall — too tall for most blog designs. However, if Pinterest is where a blogger wanted to focus his/her social media presence, it may be worth it to design the blog around this extra large image. I’m dipping my toes into the Pinterest waters, so I’m compromising. My featured images (the most recent ones, anyway) are 735 pixels wide. The height is whatever height makes sense for the particular image I’m using. My blog design will automatically resize the image from 735 pixels to around 647 pixels on a desktop (smaller for mobile devices), but when someone “pins” to Pinterest they will have the full 735 pixel image at their disposal. Thanks for the comment. I may add a note at the end of #16 to clarify things! I do have a Pinterest account, but haven’t really spend much effort building an audience. I’m thinking about creating taller images specifically for Pinterest and uploading them separately, but I’m not sure yet whether it’s worth all the effort. But, I do believe Pinterest is an untapped resource for many bloggers. And I really do plan on intensifying my marketing efforts in the platform one day soon. Oh yes, I had the same thought as you regarding creating taller images and uploading them separately. I wasn’t sure (and still aren’t sure) if it’s worth the effort! Okay, don’t get offended if I tell you I’m not going to use the majority of your tips! LOL!!! Oh and I don’t like my social buttons above the fold. The reason is after they read my content and are already at the bottom of the post then they can make that decision to share it. They shouldn’t have to scroll all the way back to the top. I don’t share a post until I’ve read it and after I’ve read it I still might not share it. I agree with only about nine of the things you shared but that’s what I love about blogging. We do not all have the same opinions. Thank goodness for that right! Because I know what works for one blogger may not work for another. There’s no one size fits all. In your opinion, should I do a better job explaining some tips aren’t right for everyone? Update: I just reread your comment and realized you misunderstood what I meant by social icons. I didn’t mean moving your “share this” icons to the top, or removing all but one of your sharing icons. I was speaking of the social icons for your Twitter handle. For your Facebook page. For your G+ profile. The icons where people go if they want to follow you. I took it that the social media icons “above the fold” were the ways to connect and follow the author. I’ve encountered some blogs with “dead” buttons. For example, I’ve tried to follow them on G+ and they don’t have a profile there. I also assumed the suggestion to pick one profile for people to follow you on was referring to this rather than giving them only one option to share content. I agree, Adrienne, that social sharing buttons belong at the end of a post. I want people to read my article before they share it. I noticed you are using a tip that wasn’t on this list: Make “tweetable” suggestions in your post and provide a link to make it easy to tweet. I’ve considered doing this. I just haven’t yet searched for the plugin to do it. These are great tips, Kevin. And I’m one of those who use RSS. I’m copying your URL into my Feedly. Welcome to the blog and thank you for commenting! Your inference is correct, although I can see how Adrienne (or someone else) could think I meant social “sharing” icons instead of social “follow me” icons since I called them, simply, “social icons.” I thought it was clear which I was referring to, but I certainly could have done a better job. I might remedy this later in the day! More times than not, I also put my social sharing icons below my content (I do this on my personal/professional website). And I did the same when Be A Better Blogger first launched. I’m in the midst of doing a case study on sharing icons, which is why the icons are placed where you see them now. So, I agree with the “share icons after your content” tactic. But I also see the merit in the “put sharing icons anywhere and everywhere” tactic! Haha. Yes! Making “tweetable” suggestions was originally part of the post, but it was removed after someone pointed out it’s not an “easy” tip to those unfamiliar with HTML code. I might add a “Bonus Tip #23” today for ClicktoTweet.com. Good list. I don’t implemet all these tips but I can understand why you have them on the list for sure. The one thing that really stood out to me was the “remove 40-60% of the info from your side bar. I have been encountering a lot of blogers really cluttering the side bar. It really is distracting! Especially, when they have the side bar on the left and right. It takes your focus of the man thing which is your content. Whether it’s your side bar, fancy backgrounds, banner ads etc we really have to keep our focus on what the readers want to see. Not what we want them to see. Thanks for this Kevin. Have a great weekend. Agreed on the sidebars. And, honestly, I think mine could stand to be trimmed a bit. Or, at the very least, I need to implement the “1 in, 1 out” strategy: If I want to add anything else to my sidebar, that’s fine, but I have to remove something that’s already there first. Though I have to chime in on the social media discussion. I have NO follow me social icons on my blog. My one goal is to encourage people to join my email list. Though I recognize many wouldn’t agree with this approach. I do encourage folks to promote their email opt-in before social media. I hadn’t thought about using a headline generator. I just checked out your link – very interesting. Though I could see me wasting hours clicking the refresh button to see what comes up! Thanks again for sharing. And I’m enjoying the great discussion in the comments here! Thank you. I noticed your “no follow me social icons” strategy when I visited your site a week or two ago. For what your site is about (helping businesses turn traffic into email subscribers), I think your strategy is awesome. I think it’s a fine strategy even if someone you had a different niche. And there are many big bloggers who would agree. In one of my old posts (“old” is relative, of course…my blog is so new, an “old” post is one older than 5 weeks! ), I mentioned how Jon Morrow recommends you ignore all social media until you’ve reached 1,000 email subscribers. Jon has built some very big blogs, so he clearly knows what he’s doing. And he would say your approach is the best approach. As you can see, I make my email list the priority. But from the get go, I made sure people could follow me on Google+. That was the social media platform I wanted to build first. Once I reached 1,000 followers on G+, I added a Twitter icon. For some reason, and I may just remedy this after I finish writing this thought, I jumped the gun and added Facebook and Pinterest icons two weeks after I added Twitter. I haven’t built up a strong Twitter following yet, so by my own logic I shouldn’t have added Facebook or Pinterest to the blog yet. Glad you found the headline generator amusing. I could lose an afternoon playing around with it, too! Thanks for visiting and comment, Sally! These are really great tips, especially the one about only focusing on one social media account if you’re having trouble gaining traction on all of them. It’s the paradox of choice, I suppose. I’ve also never heard of Smushit.com, so thanks for that! Thanks for leaving a second comment! Yeah, I don’t remember where I first heard the “concentrate on one social media platform” advice, but I think it makes a lot of sense. I started with Google+ as my one platform. Once I got over 1k followers, I started using Twitter, too. Gaining traction on Twitter has been a bit slower, for some reason! So your blog is a travel blog? It’s a travel blog where my best friend and I write “letters” to each other about our various travel plans and travel inspirations. 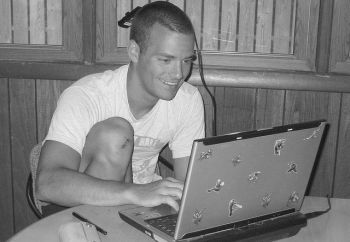 We live in different cities, and we thought writing a joint blog would be a great way to keep in touch and share our adventures. We’re a little offbeat and we don’t shy away from completely showing off our personalities. Thanks again for the recommendations. I’ll have to check them both out. That sounds cool. It must be a lot of fun to co-blog with your best friend! Plus, I imagine it takes the pressure off with writing. Since there’s two of you, no one person has to worry about writing all the content! Not only paragraphs, you should also break your sentences into shorter ones. Long sentences are always boring and annoying for the readers. Also, long sentences are often run-on sentences! I’m really excited you listed the Smush.it plugin for one of your tips. My blog is extremely image intensive and I think I consistently lose points for speed because of the time it takes for them to load. I’m in the process of re-sizing every photo to 600px so they don’t have to re-scale and I was hoping that would help with the loading time. I’m going to install smush.it and see if that also helps anything. You will be my new best friend if the speed test shoots up towards the 90s. Glad you found the Smush.it tip helpful! I’ve found the plugin to be quite helpful, personally. Another one should look into is Compressor, which I talk about here. Unlike Smush.it, which will shrink the file size of your images as you load them into WordPress, Compressor doesn’t offer a handy plugin. You have to go to their site, upload your image, have them shrink it, and then download the new version. It’s not as convenient, but for certain images Compressor reduces the size lots more than Smush.it. Let me know if you get to the 90s! I’ve implemented the smush.it plugin and so far, I’ve only smushed about 5-7 posts. My speed test increased from about 60% to 74/100. I’m super excited because I still have a ton of images to compress and I’m already seeing positive results! If it does increase to 90% when I’m finished, I’ll have to send a thank you! Oh and I love that smush.it automatically compresses images, which is something I noticed yesterday when I was re-uploading images into the media library. I must have missed this follow-up comment of yours. Sorry about that! Awesome! I’m glad the smush.it plugin has been such a big help in increasing the speed of the posts you’ve used it on. Have you tried using it on your other images yet? Thanks for Sharing those Bundle of tips.Sure they are not for everyone, you should apply what suits you well. As far as I remember , I never used it.Oh sorry, I just did that above. You are right.Many Bloggers or I would say many many many and many people are guilty of using word “That” excessively.Actually, it is not called using. It is called Abusing. So stay away from it. Yes , 100% true.We should use not only Short Paragraphs but also short Sentences.Because they are easy to consume,easy to read and easy to understand.Long sentence and Paragraphs will just bore out the reader. This is really a great thing to do.It not only decreases the Bounce Rate but also keeps your Readers engaged.This is what that attracts Advertisers. First make sure that your Content is worthy enough to get read till the end.Yes, call to action is necessary.Don’t leave them idle because they always have an option of Closing the Tab. I think I am working great on that Tip :). You should rename them before uploading with a Meaningful Name.It will give you an edge over your Competitor. Thanks for the long comment! I appreciate hearing your thoughts on several of the points I mentioned in my post. Your point on bounce rates and linking within posts is a good one. That’s another benefit, for sure. Hope you have a great day, YF.